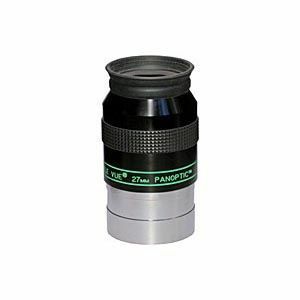 Televue 27mm Panoptic Eyepiece - 2"
All TeleVue Panoptic Eyepieces, including the 27mm Panoptic eyepiece, features multi-coatings, blackened lens edges, filter threads, rubber grip rings. This TeleVue Panoptic Eyepiece is 27mm, offers 19mm of eye relief and a 68º apparent field of view in a 2" barrel size. With the Panoptic series, Televue has taken the Wide-Field concept to Naglerlike performance levels - A meaningful advance over any eyepiece in its 68 degree field class. The TeleVue 35mm Panoptic eyepiece is housed in a 2" barrel like the 35mm, the 27mm is lighter and smaller. It's perfect for any telescope size, type or speed, where a little more magnification is desired, yet still allows full field viewing with eyeglasses. For example, with the Genesis sdf, it gives 20x and a true field over 3 degrees!